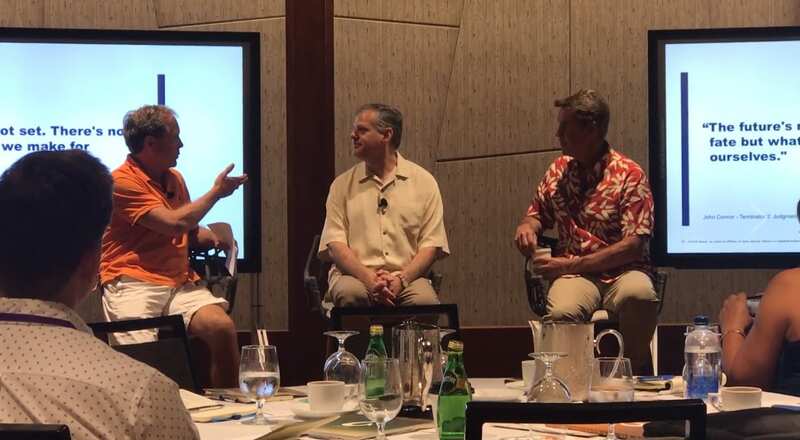 Culture: Founding partner of OluKai, Dan McInerny presented on the importance of respect, space, and fully immersing your organization in culture, people, and place. Rather than using demographics for attracting new talent, OluKai relies on psychographics for a greater match with the individual to the organization. Even though this process takes longer than the normal recruiting process, Dan McInerny truly believes in finding employees for organizational fit and aligned beliefs. Change: Senior Vice President of Whitespace at Lululemon defines innovation as a fundamental behavior rather than a situational incidence. The Physical Space and the Digital Space will continue to collide. IT will become HR for robots. We must Learn, Unlearn, and then Relearn in order to keep up with the pace of change. Bluescape, who coordinated this event, gave intriguing insight as well. Chief Technology Officer, Demian Entrekin, believes that we need to defragment our information and messaging in order to deal with the mounting pressure our organizations are feeling from digital disruption. Also, Damien shared the concept of the Golden Triangle where understanding, agreement, and action are shared throughout an entire organization. Next, Jennifer Hill, Managing Director at JLL, predicted that by 2030, 30% of all Commercial Real Estate will become flexible space and 4.8 billion of square feet will be flexible space. She also presented 5 dimensions that JLL believes are the future of work: (1) Digital Drive, (2) Continuous Innovation, (3) Operational Excellence, (4) Financial Performance, and (5) Human Experience. The Director of Global Sales at Intel, Tom Loza, presented an innovative new product called the Intel Unite which is designed to solve the universal collaboration problem, complexity. Make sure to return for future videos because we will make a video on this product if we can get our hands on it. Finally, Amber Goelst, who handles Global UX and Strategy at Wacom, assured us that innovation is for everyone. Some tips on innovation include being curious, being brave, being humble, and being tenacious. We’re all players in this game to shape the future of work. Digital disruption is a challenge, but it is also exciting and inspiring. Wherever the trail leads, just be sure to enjoy the journey. Huge thank you to Bluescape for making this phenomenal event happen! Have any thoughts or comments about these topics? Wanna learn more about what you can do to stay ahead of the digital curve? Connect with the experts at Workspace Digital today!